2. The metal drawer pulls on the Disney animation furniture are perfect bottle openers. Whether this was by design or a happy accident doesn’t matter as many a beer bottle was opened using them. But, as societal norms have changed such frivolity has been curbed and in some cases frowned upon. 3. 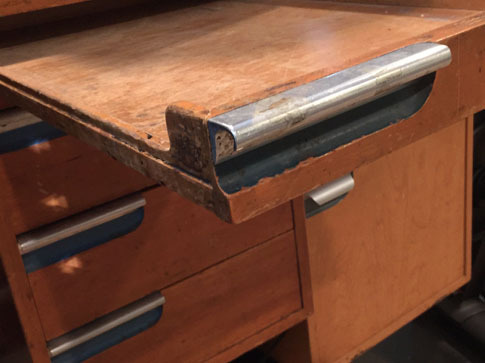 The deep drawers in the lower half of the desks, UNITS No. 14, 19, 1B , 2 and 2A were designed for deep storage. But, as studio legend has it, the drawer is the perfect height for a fifth of liquor standing in the drawer when closed. Note the bottle ring in the empty space where the deep draw should be on the lower right of the desk above. Certainly, this came in handy for imbibing in the afternoon, which was socially acceptable at work during that time period. Today, of course, there are likely no artists that are keeping liquor in their desk for fear of a visit to the HR representative. 4. 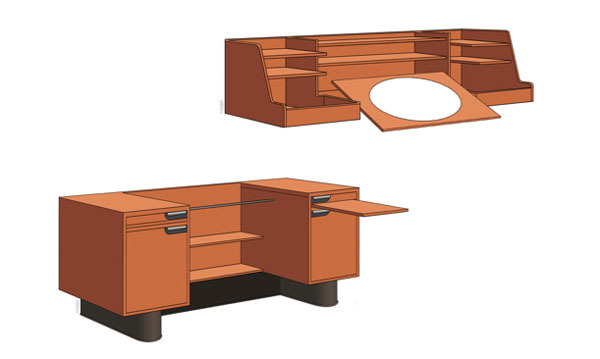 The Weber animation desks were built in a modular design in which there were several different upper and lower units that could be mixed and matched. This was an ingenious way of allowing the artists to customize their desks and it was ahead of its time in terms of modular furniture construction. 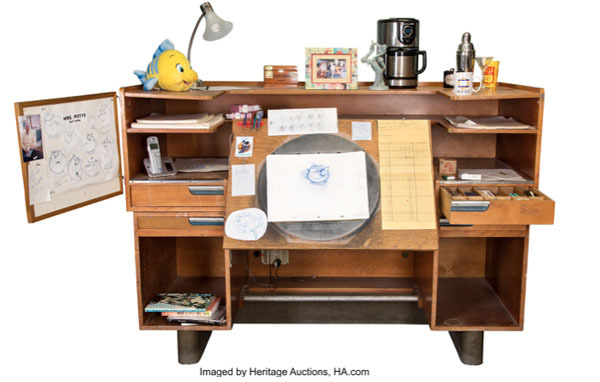 The Weber animation desks took on an almost mythic status with newer artists laying claim to desks that had belonged to Disney animation legends. Some even felt that the patinaed desks emitted an aura of those who had previously occupied the furniture. 5. 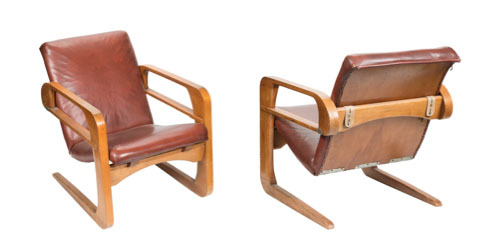 Weber first started experimenting with the Airline Chair with a 1929 prototype. He wanted an affordable modern chair that could be carried home in a box and assembled by the consumer in minutes. He was years ahead of IKEA. By 1935, Weber had perfected his design but it was the depth of the Great Depression and he could not get traction on selling these chairs to the masses. 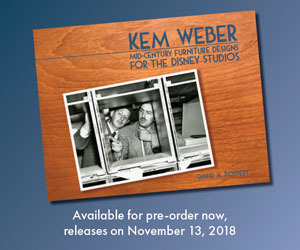 But, when he got the Disney Studio project, Weber was able to convince Walt Disney to purchase 200 of these chairs for his new studio complex. In all, only about 300 of these chairs were ever made. The Studio still has about 125 left, the other 75 may have “walked away” over the years. 6. It was common for employees to smoke at the office and more than fifty-percent of the U.S. population were smokers in 1940. 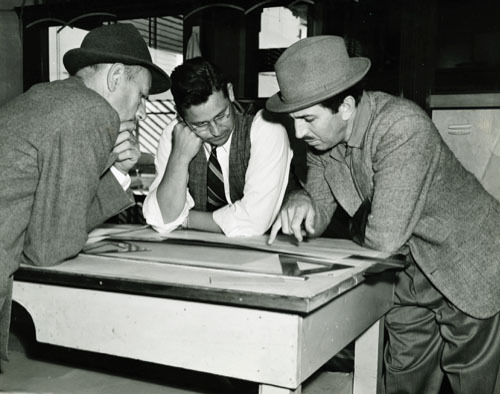 At the Hyperion Studio, artists frequently would lay a lit cigarette on the edge of their desk as they drew and flipped their animation, which required two hands. In between drawings, they’d pick up the cigarette to take a drag off it and put it back on the edge of the desk or in an ashtray. But, sometimes the cigarette burned the top of the desk. 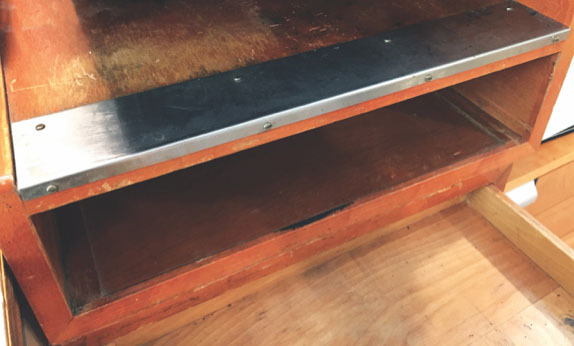 This was frequent enough that a “Cigarette Protector” was added to the Weber animation desks at the new Burbank studio to prevent burns to the furniture surface. The cigarette protector was a two-and-half-inch wide strip of stainless steel that had a quarter-inch lip on it that was screwed to the desk on either side of the drawing board for the regular animation desk and on the right side for the modified or compact animator’s desk. Very interesting. Is there any evidence that such attention to detail was paid to the furniture/tools of other professions within the studio? 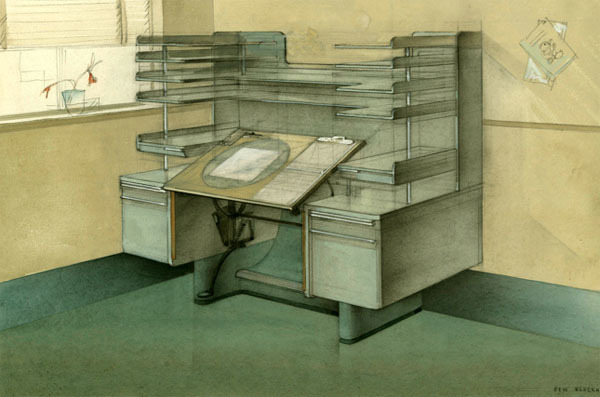 Layout artists had a similar desk, but with a big flat surface instead of the disc, and not so many shelves. Yes, there many examples of custom or one off pieces that were made including the mail sorting desks for the traffic dept at the studio. Interesting! Where were the Florida animation desks made? I have one at home. No liquor or cigarettes… Smoking was permitted in designated areas only…They were sold to us after the completion of the “swan song” of the Studio, Brother Bear. The Florida furniture was made in Canada and it was inspired by the Weber furniture. Ah, yes. Always loved that furniture, and the spirit behind it. One of my favorite designs was the little roll-away desk used in the camera department for touching up cels and other art. They had a disc tabletop that folded flat, and two little hinged storage wings for art supplies. Studio beers are not a dead tradition!